Maximum concealment means more than just the size and weight of a rifle. There are many features that come into play such as where the controls are, how the rifle can be handled in many positions, and the visibility of the flash. That’s why we reinvented a few of these features. As with all our rifles, we built a bullpup system to create a very compact rifle with the same firepower as tradition M4 rifles. We also realized you want to minimize body exposure. With such a compact rifle, we designed fully ambidextrous controls and a forward ejection system so you can transition between left and right shoulders without the risk of increased body exposure or having casings eject into your face. In the example above, the operator is coming coming around the corner on the right. With other systems this would mean exposing the left side of your body. 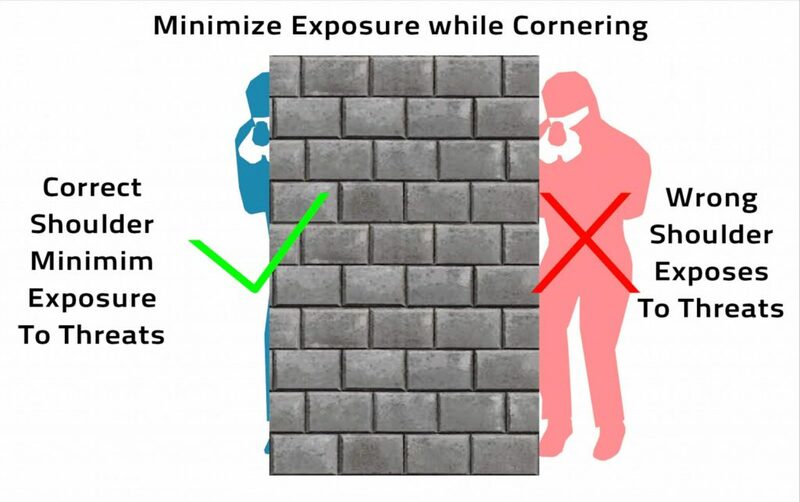 You could do a lean technique but you would still be exposing more parts of your body, such as your shoulders and the greater portion of your head. 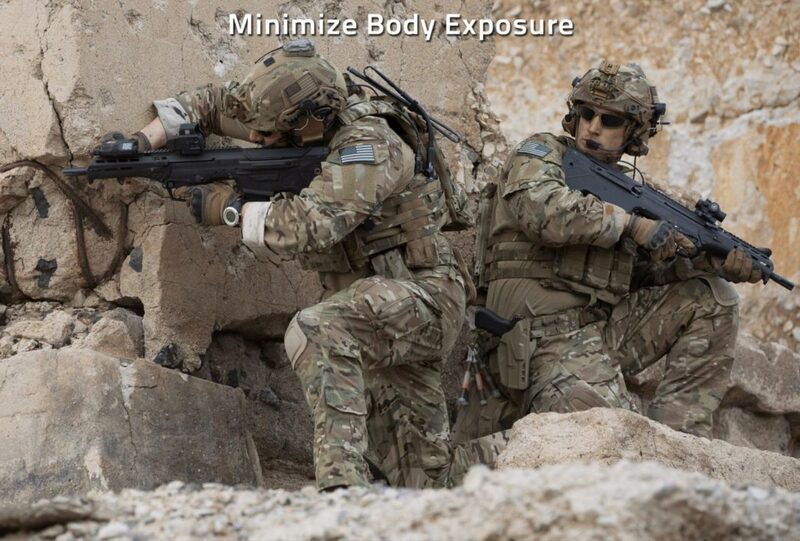 With the MDR, transitioning from right to left shoulder, the only thing you expose is the end of the rifle and your eyeball, ready to engage a threat. As you fire your rifle, you don’t want the flash to give away your location. The tip of the MDR is equipped with a 3-prong flash hider that does exceptionally well at hiding the flash while firing. You don’t want your gun to shine, especially under infrared at night, and you don’t want your rifle to be a flashlight for everyone to see where you are at night. The MDR is coated with an anti-reflective type 3 anodize, which is very non-reflective eliminating exposure at night. As you shoot high volumes of rounds you need to have very few malfunctions. With the MDR, we performed the standard US Military Longevity Tests. We shot 10,000 rounds, taking a break every 200 rounds fired, then cleaning the rifle every 1,000 rounds. With the MDR we found great performance when testing rifle malfunctions, when compared to other rifles. The MDR had a type 1 malfunction every 2,000 rounds, type 2 malfunction every 5,000 rounds, and type 3 malfunction that occurred in excess of 5,000 rounds. Type 1 Malfunction: A malfunction that the operator can clear within 10 seconds or less without any tools. Type 2 Malfunction: A malfunction that the operator took more than 10 seconds to clear, but was able to clear himself. Type 3 Malfunction: A malfunction that occurs which requires an armorer, using tools and possibly replacing a part. We were very pleased with the results when comparing with the M4A1, which had a type 1 stoppage about every 500 rounds. This is a 4x increase in performance when comparing this with the MDR type 1 malfunctions occurring every 2,000 rounds. 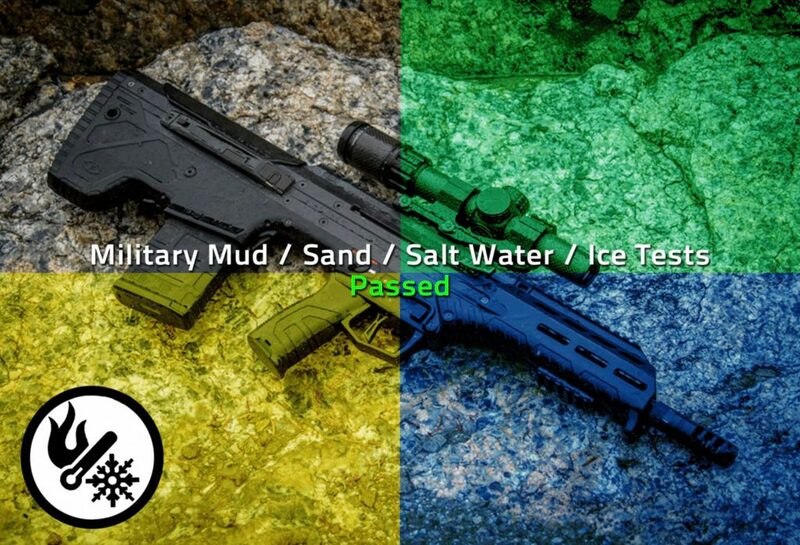 The military does Mud, Sand, Salt Water, and Ice Testing on their weapons. We conducted all of these tests during development to ensure that the MDR would be able to perform, and it passed all of those tests. We’ve shared some of these tests with you, such as the Mud Test, Bore Obstruction Test, and the Drop Test. We’ll be sharing the rest of them in the upcoming weeks. Another reliability factor is how dirty the gun gets with continued operation. If you look back at the Mark 18, it has a short 10.3” barrel with a direct impingement system, which means the gas comes down a tube and dumps directly on the bolt carrier. This really dirties up the mechanisms inside the receiver, requiring more frequent cleaning by nature. 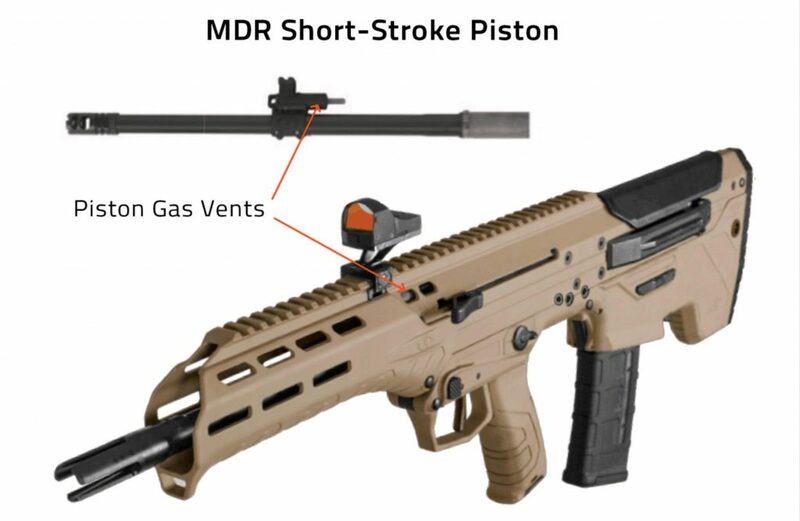 With the Desert Tech MDR, the gas uses a short piston at the front to cycle the action, then the piston pushes back on the action. We have 2 vents on the front of the short-stroke piston that vent the excess gas outside of the receiver, far away from the bolt carrier. This keeps the MDR running much cleaner. Many of you understand that a short-stroke piston is much cleaner and reliable because it doesn’t dirty up the action. Because of the short-stroke piston, it’s one of the reasons why we were able to make 2,000 round count before we experienced type 1 malfunctions. Durability means you can shoot many rounds through a rifle and it will still last for a very long time. We’ve already mentioned all the endurance tests at 10,000 rounds but we’ve been shooting these rifles beyond 10,000 rounds and here’s what we’ve found. While performing longevity tests with the 5.56 MDR, we have shot over 40,000 rounds through many of our rifles with tests ongoing. As we do this it helps us to understand the life of a part, how long before springs wear out, and what the schedule needs to be for the different part replacements. If you gun falls on the ground, you want it to still operate. 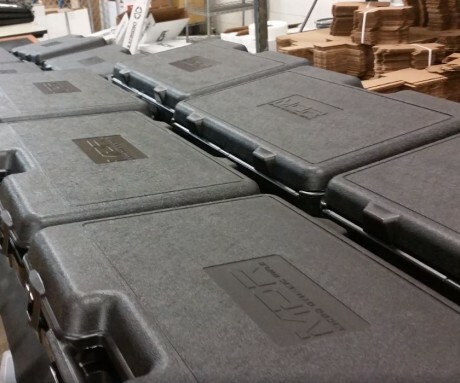 With our drop testing, the rifles still fired with no malfunctions whatsoever. We didn’t experience any issues firing from any orientations of the drop tests. What happens when you lodge a projectile in front of your chamber and fire a round out of your gun? Bore obstruction can cause extreme pressure and catastrophic failure of the rifle making it very dangerous and sometimes fatal for the operator. While going through these tests initially during development the gases would blow back through the brass, pushing the body carrier back, rotating the bolt out of battery, causing those excess gases to flow back into the action and blow out the lower receiver. This had a grenade effect, which was bad! As we faced this problem, we realized we could not produce a rifle that did this. 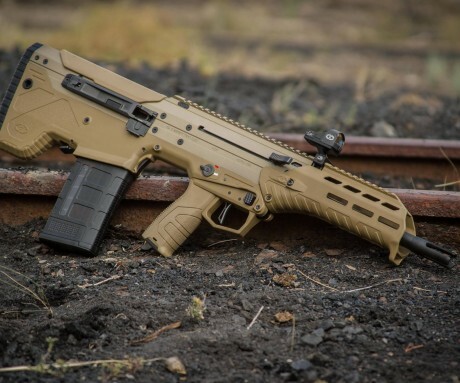 The interesting part of this was when we tested other rifles, looking to see what the industry norm was, we discovered other rifles in the .308 caliber had that same issue. This really surprised us that some of these other “military grade” rifles actually had this problem. We’ll be sharing more of these tests with you in the weeks to come as well. After initial tests through R&D, we went back to the drawing board and developed what we call a Gas Control System. To explain it simply, we have a flange that seals the chamber with a locking mechanism between the barrel extension and the chamber. Now if there is an overpressure instance, the lug seizes up and refuses to open, preventing gases to leak back into the receiver. We’ve also have a vent hole in the top of the barrel extension, and 2 plastic forks on the sides of the picatinny rail. If you have over-pressure those gases vent up through that system and blow out the sides, the plastic pieces pop out, releasing the gas. Because of this system there’s no shrapnel or anything else that’s going to hurt the operator of the rifle. We have been very pleased with this design, and it’s made it the safest .308 rifle that we’ve ever tested. 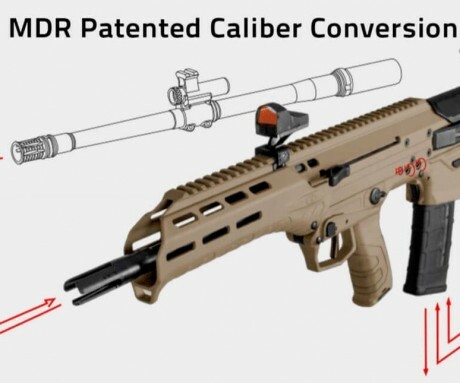 The MDR has more innovation and thought behind these and other features than any other rifle on the market that we’ve seen. We hope you can appreciate the extreme level of focus making the MDR a rifle that you can take with you on any mission and ensure maximum survivability.